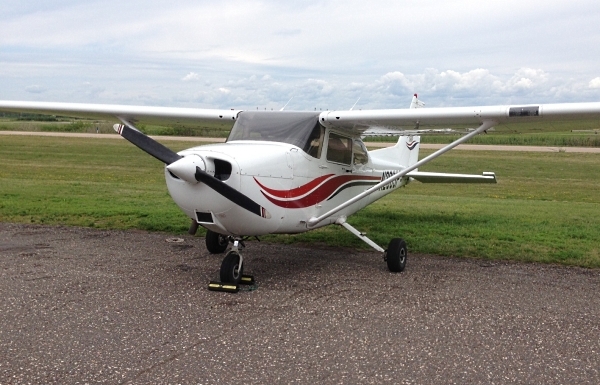 A couple of weekends ago I took a flight lesson out of a small airport in Blaine, Minnesota. This was my second one-hour session. The first was about two years ago and it was fantastic. Every awesome thing you’ve heard about flying an airplane is true. I suspect it’s also true what airline pilots say in that, after a while, you’re just driving the bus. Still, for those of us that don’t do it regularly, flying an airplane is outstanding, and dreams of getting that solo license quickly spread over your gray spongy bits like a red mist. Shockingly, the flight instructors don’t start you out in Learjet. Something smaller, perhaps, even if you’ve done it before. These little Cessna 172SP models are very analog, not unlike a vintage car. The gauges yawn and casually wake up when you flip the power toggle, the flight controls are all via cable and bell crank, and you adjust the fuel mixture and engine speed with manual controls on the panel down by your knees. Speaking of the pancake four-banger motor, it likes a certain level of oil, which is more than none but less than the flight manual calls for; too much and it just releases the excess on to the ground. Furthering the goofy old car analogy, before you go anywhere it behooves you to walk around the vehicle looking for parts attempting to separate themselves from the whole as well as wayward fluids. Bugs generally won’t hurt a Cessna, but damage from birds will. The session went just fine, with Jake the instructor calling the shots but yours truly doing most of the flying. When you feel your guts compress in a 2 g turn at 45-degrees over, you can’t believe what an astronaut or even a Formula 1 driver goes through. Remembering to breathe is key to not passing out. Also shockingly, Jake insisted he land the plane. The Anoka County Airport’s security is probably as good as it needs to be. 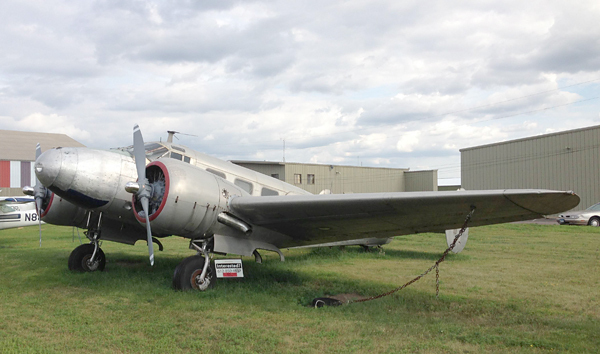 Meaning, after my lesson I was free to drive around the airport grounds and scope old and/or interesting aircraft. Tucked in a corner were a bunch of vintage planes and accompanying ground equipment and vehicles likely used in the annual air show. Scattered around the grounds were private aircraft (presumably) and a few automobiles and motorcycles. Arnold Palmer was just leaving in his private Cessna Citation 10 jet, which up until recently he – at 80-something years old – would fly himself. 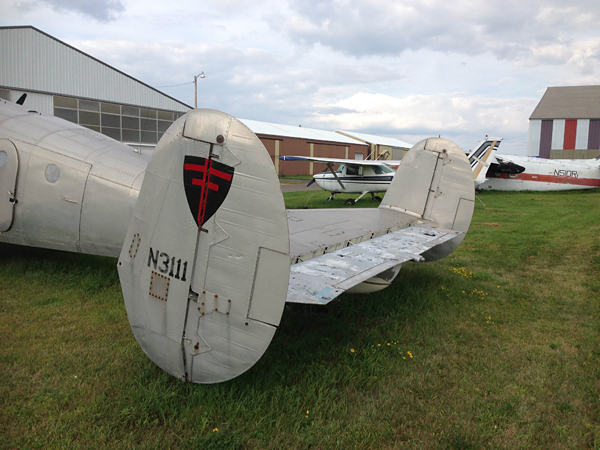 Then I spotted it, a 1957 Beechcraft Model D18S, for sale in all its dull aluminum glory. 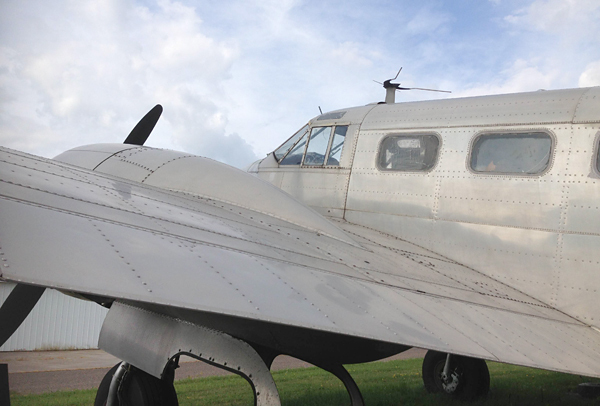 I’m really only talking about old airplanes – the ones with shiny skin and propellers driven by massive engines that sound like hell with the lid off. I think I fundamentally understand how a jet engine works. 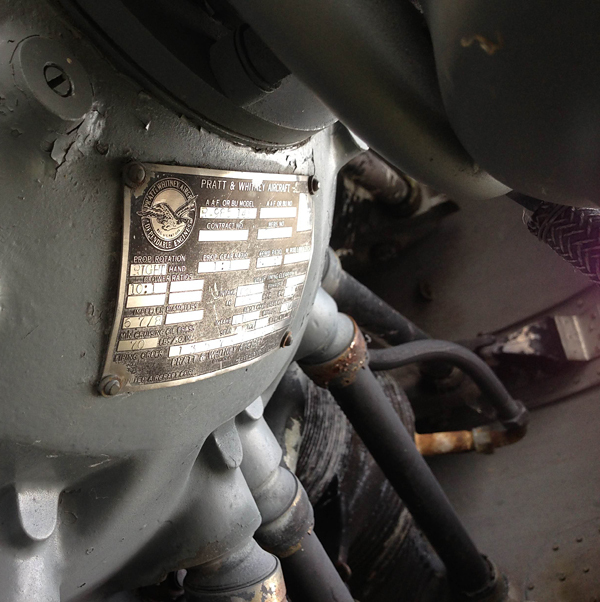 But once I figured out how a radial piston engine turns fuel into noise, there wasn’t any contest. Watching the little jets go around the pylons at the National Championship Air Races in Reno, Nevada does little for me. Seeing the same course run by pilots in WW2 birds being flown like they were stolen… sign me up again and again. This Twin Beech appeared to be all there in that it had all its wings, engines (large Pratt & Whitney 9-cylinders), and tires. Little else could be discerned from a walk-around, but I did notice it was missing a window or two and that it was chained to the ground, possibly as a theft deterrent or maybe to keep it from blowing away. It also had a padlock on the door, which appeared to be slightly ajar. What else? I have no idea and I haven’t called the phone number. Yet. But what would it cost to make this dusty relic into a viable airplane. Based on some quick internet research, budget $90,000 for a living, breathing aircraft that needs work but would probably get you to your destination. 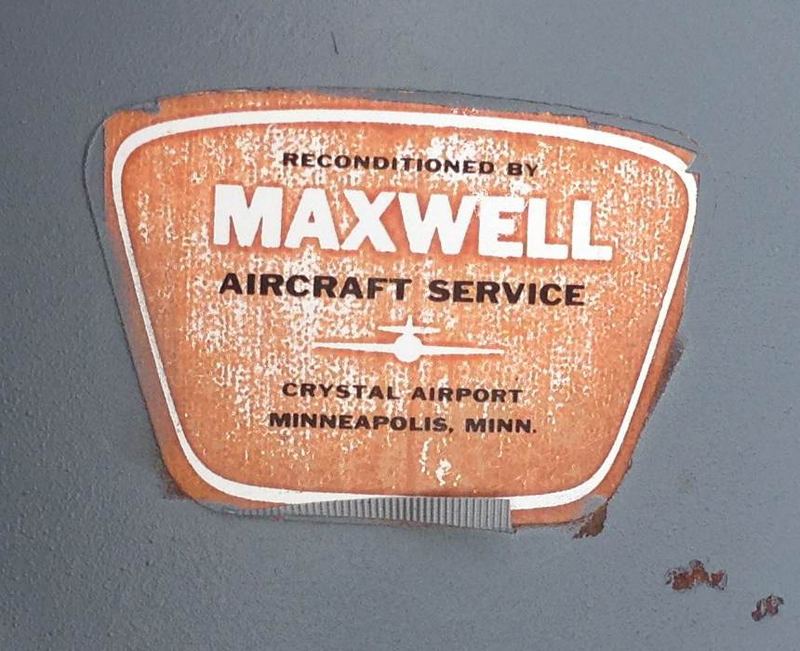 For a “done” plane with modern avionics and all its certificates? Probably in the $200,000 neighborhood. Assuming this D18S was even $20,000 (likely a low number), I have to figure restoring it would be financial self-immolation for even the stoutest of amateur geeks. And that’s you doing the work, valuing your time at $0.00/hour. And that’s kind of the thing, isn’t it? Epilogue: I happened to be having drinks with my friend Vernon last night and mentioned I had stopped at the airport, not ten minutes away from where we were standing, to take additional photos for this piece. 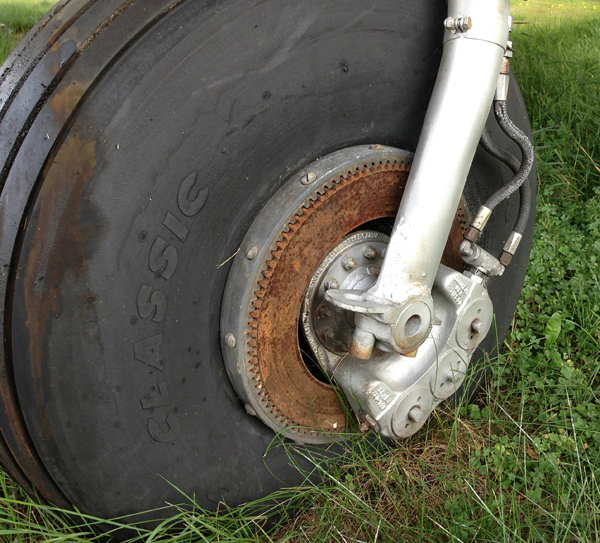 Vernon actually knows the plane, and said it had been sitting in that grass since the early 1990s. Turns out, his dad was one the main plane wrenches at that airport. 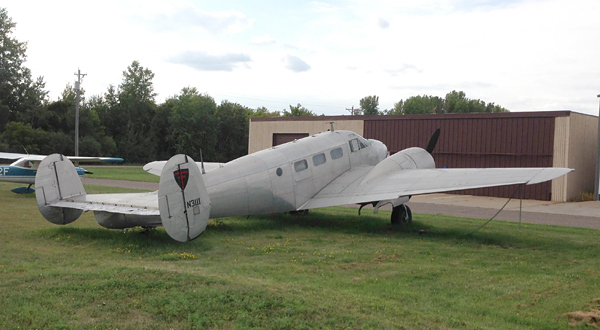 Further, his dad still keeps a hanger at Anoka with a couple of planes sitting in it, though he doesn’t fly any more. Vernon has a lot of hours in many cockpits as well and said there’s little he likes more than being in the air. I suspect Vernon and his dad have many stories to tell. And that’s kind of the thing, too, isn’t it? This entry was posted on Thursday, August 15th, 2013 at 11:47 AM	and tagged with 172SP, Anoka County Airport, Beechcraft, Cessna, D18S, National Championship Air Races, Pratt & Whitney, Reno Air Racing Association, Twin Beech, Twin Cities Aviation and posted in Totally That Stupid. You can follow any responses to this entry through the RSS 2.0 feed. « 1977 Fiat 132: The Cars of our Fathers….. If you like radials, check out the Beech Staggerwing. Thanks for posting that, Satan. Nice to get a guest poster once in a while. Though how Jonathan got you to post on his blog is probably a great story. And that’s kind of the thing, too. Just follow the instruction on the red sticker and you’ll be fine. I know a guy named Hitchcock who would love this project!! That looks like a diamond in the rough it looks like it would not take much to bring it back and I’ll give them a call Thank you big time. @Ken – Wow! Let us know how it goes! I touched a similar airplane in 2007, finally flew it in 2014. If you love to fly its worth the time, effort and cash. Plan on 1 hour fuel stops. 20 min to pump 150-175 gallons of 100LL and 1/2 gallon on oil into it. then 40 minutes to talk to all the old guys that will gather around. There is nothing like pushing the money levers forward and letting those Pratt and Whitney R-985s make a little noise. Fly by rule is in effect. We… well… it’s probably too late for that, right? That is absolutely outstanding! We here at TTS are excited she will be returned to the air! We will make it a point to visit; thank you for the invitation. OMG, I just got my private and was looking for a used Cirrus SR22 to possible lease back to my local flight school to stop the bleeding when I saw pics of the Beechcraft C-45 or 10 or any version of it. I just fell hopelessly in love with an airplane. Sold mine 10 years ago ……… miss her every day ! !